This is about the third deep dish pizza recipe I've got here on this blog. The first is a simple recipe to be made in a large cast iron skillet. The second is a Chicago-Style Deep Dish Pizza, and this one is my most recent favorite. The recipe comes from a book titled Pasta & Pizza Presto. I think this dough recipe is the only recipe I've tried from this book, but it makes such a good crust, that I keep this book in my favorite recipe book collection on my kitchen counter. I use this awesome pizzeria pan that my husband purchased for me one Christmas. It's a pan that was used in an actual pizza restaurant, so it came to me all dark and well-seasoned. That sounds sort of strange as I type it, but it's really a perfect deep dish pizza pan. It's 14 inches in diameter, so the resulting pizza is large enough to feed our whole family of four. 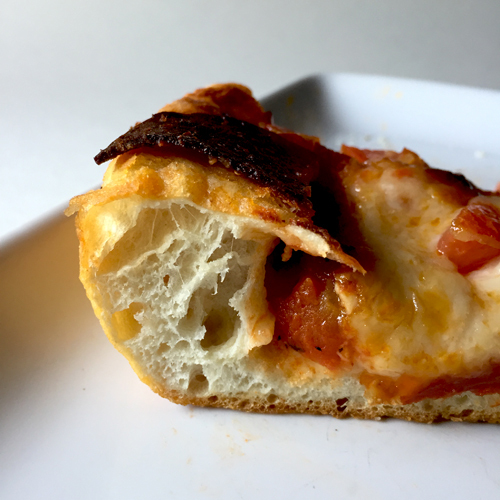 The crust of this pizza is thick and, well, crusty on the outside. It's soft, tender and chewy as well. It holds up to the pound of cheese on top, but I do like to eat mine with a knife and fork. I like putting a little bit of garlic salt on the bottom of the pan before putting in the dough just for an extra yummy layer of flavor, and for the bit of crust left at the end. So good. This is just a nice, simple, and delicious deep dish crust. I think you'll like it. In the bowl of a standing mixer fitted with a dough hook* mix the flour, salt, and yeast. Turn the mixer on low and add the water and olive oil. Knead dough on medium low speed for about 4-5 minutes. Remove hook and cover bowl with plastic wrap. Allow dough to rise until doubled in size, about 1 hour. Reattatch dough hook to mixer and knead dough for about a minute. Turn dough out onto a floured surface and cover with inverted bowl and allow dough to rest under the bowl for about 10 minutes. *If you do not have a stand mixer, you can mix with a wooden spoon and then knead dough on a lightly floured surface for 8-10 minutes. While dough rises, prepare the sauce. In a skillet over medium heat, melt the 2 tablespoons butter. Then add the grated onion, oregano and basil. Cook over medium heat for about 4-5 minutes, stirring occasionally, until liquid is evaporated and onions turn golden. Add minced garlic, stir, and allow to cook for about 30 seconds. Add tomatoes, honey, and red pepper flakes. Stir and bring to a simmer. Reduce heat to medium low and simmer for about 25-30 minutes, or until sauce is reduced to about 2 1/2 cups. Remove from heat and allow to cool a bit. Add 2 tablespoons of canola oil (or other oil) to the bottom of a 14 inch deep dish pizza pan. With your fingers, spread oil all around the edges and bottom of the pan. Sprinkle with about 1/4 teaspoon garlic salt. Set aside. Push, pull, and/or roll the dough out into a 14-inch circle. Place in the bottom of the pan and make sure the dough pretty much goes up to the edges of the pan. Spread the pizza sauce across the entire surface of the dough. Sprinkle the shredded mozzarella cheese. 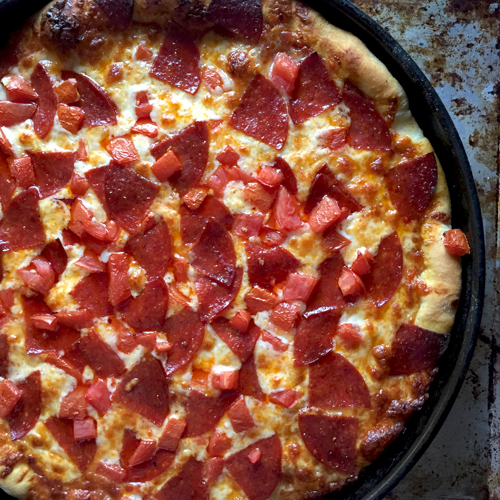 Top with your favorite pizza toppings (I used about 1/3 pound pepperoni and 2 diced roma tomatoes). Bake at 425 degrees for about 20-30 minutes, or until edges of crust are golden brown and the cheese is very melted and toppings are cooked and browned. Remove from the oven and run a metal spatula all around the edge of the pan to loosen any stuck parts. Carefully use the spatula to move the pizza out of the pan and onto a cutting surface. 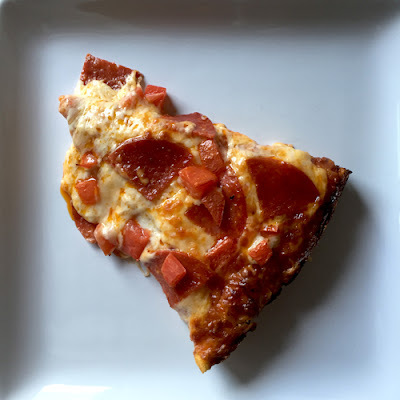 Cut with a pizza cutter into slices and enjoy. Such a nice, chewy, tender crust. 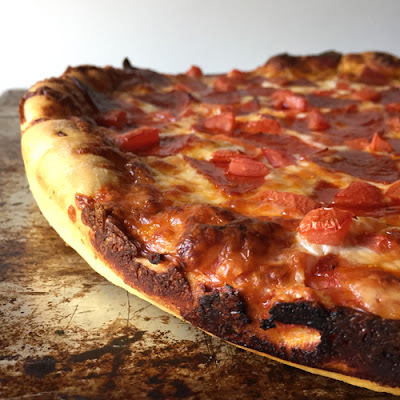 That's a piece of burned pepperoni on top there.